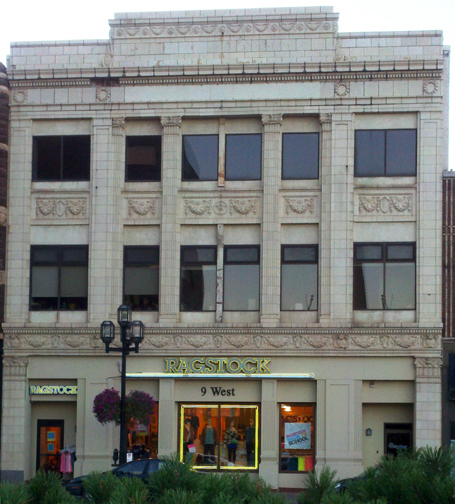 This building was designed as Duluth’s most exclusive department store for Bernard and Nettie Silberstein and contain one of, if not the, first Otis elevators in Duluth. The building was designed by George Wirth in 1884. Frederick German, who also designed the Silberstein’s home on 21st Avenue East, oversaw the addition of the second floor in 1904, matching Wirth’s original design. The Silberstein store remained open until Nettie Silberstein passed away in 1933. Marty and Laura Weintraub now operate their aimClear internet marketing business from the surprisingly adapted second-floor office space. The first floor is also open as Rag Stock. The third floor is not open for tours yet, but does contain much of the original store finishes including original wallpaper and decorative tin ceilings.